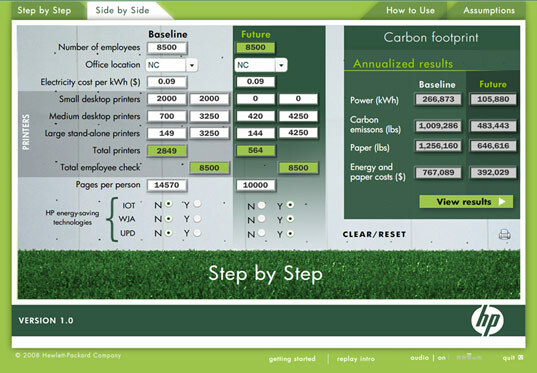 HP has rolled out a system that identifies eco-friendly features of its products to customers. It’s called the Eco Highlights label, and it provides quick facts about the product that may or may not convince the customer that it’s environmentally friendly. But as a company inextricably tied to the paper industry, how can HP promote sustainable consumption? We caught up with Michelle Price, HP’s worldwide environmental strategic marketing manager, to ask her a few questions about HP’s latest green initiatives. Some of the features listed on the online version of the Eco Highlights label for the HP Deskjet D2545 printer, like “save paper with the print cancel button,” are dubious at best. Personally, I think it’s unwise to talk about saving paper when trying to sell someone a printer. But HP talks about saving paper a lot. I doubt that HP really helps its customers reduce paper consumption – another way the company claims to save paper is with the Smart Web Printing feature, which seems to serve the same function as cutting and pasting web content into Word. But the company has an extensive paper policy designed to reduce the amount of paper consumed in the course of business operations. Plus, they use advanced teleconferencing instead of having employees travel for work. But is it possible for HP to be green if their printers are not? I interviewed Michelle Price about HP and the Deskjet D2545, one of the first printers to feature the Eco Highlights label. The D2545 is made from 83% recycled materials, comes in packaging that is 100% recyclable, and is ENERGY STAR certified. What does the Eco Highlights label indicate, specifically? The HP Eco Highlights label is used to summarize features that reduce the environmental impact of a product, tool or service, such as energy use and recyclability. The label was created to help customers make better informed decisions when it comes to the environment and will be used across all of HP’s businesses. 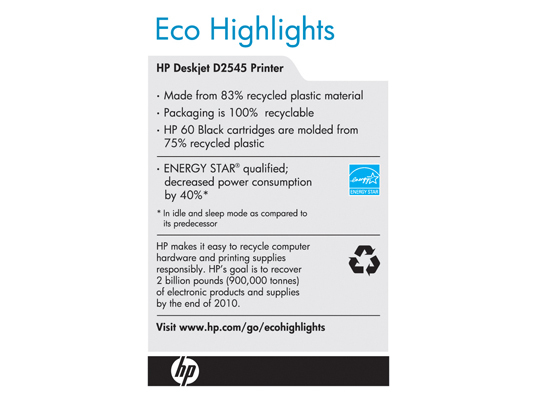 The HP Deskjet D2545 printer was one of the first HP products to feature the HP Eco Highlights label. Customers will be able to locate the Eco Highlights label on packaging, the Web and in product data sheets. How does the energy consumption of the HP Deskjet D2545 printer compare to other printers by HP and its competitors? The HP Deskjet D2545 printer was engineered for energy efficiency from the start and supports HP’s commitment to reduce overall energy consumption for its printing products by a total of 40 percent (relative to 2005 models). As the worldwide leader in imaging and printing, HP is confident that its technology innovations and products will continue to compare favorably to competitive offerings in measuring quality, speed, ease of use or in this case, energy efficiency. HP has been touting Smart Web Printing as part of its environmental efforts. Can you explain what Smart Web Printing is? Many HP printers, including the HP Deskjet D2545, include HP Smart Web Printing technology. This technology saves paper and optimizes web printing by letting users easily combine text and graphics from numerous web pages onto one page. Users can automatically scale web page output to fit the paper in the printer, ensuring that the text and images seen onscreen are captured on the printed page and also eliminates right edge clipping. HP Smart Web Printing also enables users to create personal digital scrapbooks by transferring text and graphics to a custom document where they can then be edited and resized. Users can save custom documents as an Adobe PDF file. Which features earned the D2545 its Energy Star recognition? The HP Deskjet D2545 automatically goes into sleep mode after periods of inactivity. Sleep mode uses less than 2 watts of electricity. Has HP reduced the amount of packaging for its printers, including the D2545? Packing and storing efficiency of the HP Deskjet D2545 has improved by over 28 percent which in turn reduces shipping cost and energy use. Additionally, the in box product end-caps are made from 100 percent recycled materials of molded pulp material and the product packaging. In 2007, HP redesigned its print cartridge packaging in North America to eliminate the use of nearly 15 million pounds of materials, including 3 million pounds of corrugated cardboard. The packaging also eliminated the use of more than 6.8 million pounds of polyvinyl chloride (PVC) plastic through material reduction and substitution of recycled content plastic and paperboard. Describe the HP Halo Collaboration Studios effort and how it will reduce HP’s environmental impact. HP Halo is a state-of-the-art telepresence solution that brings meeting attendees from around the globe together in an environment that feels as if they are in the same room. 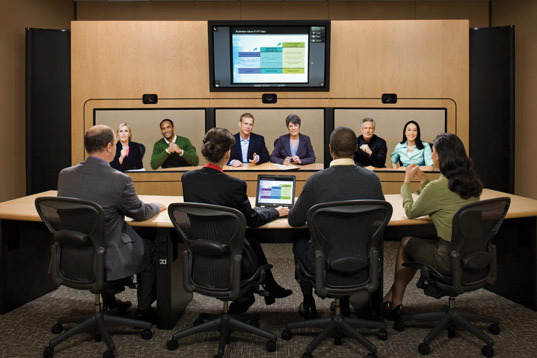 HP Halo Telepresence Solutions provide a digital alternative to business travel. While it may seem as though one person’s reduced travel wouldn’t have a huge impact on the environment, the cumulative effect of many individuals choosing to use HP Halo over travel could have a profound impact in reducing air travel and related carbon dioxide emissions. For example, on one project an HP manufacturing team transferred an entire product line from its R&D beginnings in Oregon to its permanent home in Singapore. Not only did the use of Halo shave an estimated 44 international trips off the project, Halo also boosted productivity and cut the project time in half. The elimination of 44 international trips represents over 143 metric tons of CO2, the equivalent of the electricity usage of 18 U.S. households for one year or the equivalent of preserving 1.17 acres from deforestation. As a company inextricably tied to the paper industry, how does HP promote sustainable consumption? How does the company reduce? How does it reuse? And how does it recycle? Printing is important to HP’s business, and so is being a good global citizen. HP makes it easier for customers to print responsibly with a variety of tools and services to help conserve paper, save energy, and reduce their carbon footprint. …For decades HP has worked to manage its environmental impact by adopting environmentally responsible practices in its operations, which includes everything from efforts to automate duplex printing internally and make recycling widely available, to using renewable resources such as solar and wind power and offering incentives to employees to take public transportation. In another step towards furthering supply chain social and environmental responsibility within the technology industry, HP recently announced its list of top suppliers as well as the company’s efforts to advance women’s health issues among its suppliers. · HP pledged to reduce the environmental impact of the papers that the company buys, uses, and sells by establishing one of the most comprehensive paper policies in the industry. The new policy includes not only the paper used for printing everyday office documents, but also the papers used for HP’s own marketing collateral materials. HP’s paper policy outlines six guiding principles that apply worldwide to HP branded paper, as well as paper used for HP’s internal operations, external marketing collateral and product packaging. The guiding principles include efficient use of raw materials, sustainable forestry practices, responsible and low carbon production, waste minimization, community and human well-being and environmental leadership and management. · HP’s efforts to automate duplex printing at HP sites will result in an estimated 25 percent paper savings – or 800 tons of paper a year – across the company. · HP began electronics recycling back in 1987 and officially launched the HP Planet Partners return and recycling program for HP LaserJet print cartridges in 1991. Today, HP Planet Partners makes it easy for customers to recycle any brand of computer equipment or HP supplies to customers in more than 50 countries, regions and territories. 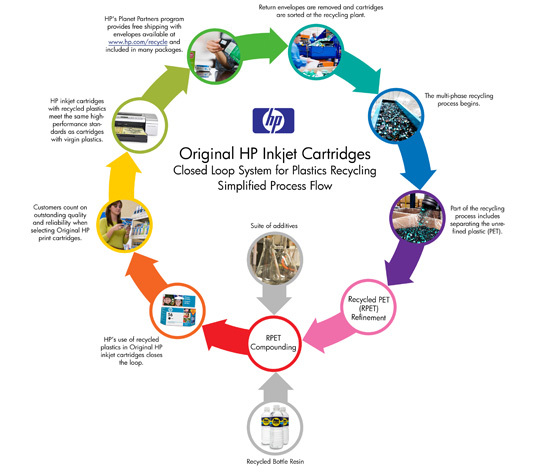 · HP developed an unprecedented, “closed loop” plastic recycling system that incorporates post-consumer recycled plastics – from sources such as water bottles and ink cartridges – into the manufacturing of new Original HP inkjet print cartridges. Give me an idea of the next eco-friendly printer to follow in the D2545’s footprints. What sustainable features will it have? In July, HP announced the HP Photosmart D5460. 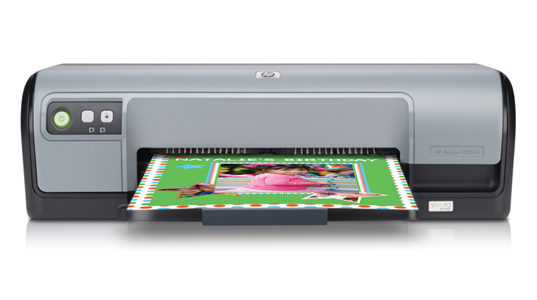 The HP Photosmart D5460 introduces a new use for recycled plastic. The printhead uses 55 percent recycled polyethylene terephthalate (RPET) plastic, which is derived from Original HP ink cartridges collected from customers through the HP Planet Partners return and recycling program and other sources, such as water bottles. HP continually strives to develop new technologies that improve energy efficiency, reduce paper consumption, and decrease both our environmental impact and the environmental impact of our customers. I'm writing this from India: as a company HPcould really uphold the enviornmental cause by simply opting to provide better support for the repair and reuse of its products. HP present policy does not support this; instead the company encourages customers to buy new products all the time (what else do you expect?). You might have a printer with minor damage - which can be rectified easily - but the company support staff will encourage you to buy a new printer at a discount. Think of all the junk that this company is generating. And amid all this the claim that they are a 'green" company. HP has rolled out a system that identifies eco-friendly features of its products to customers. It’s called the Eco Highlights label, and it provides quick facts about the product that may or may not convince the customer that it’s environmentally friendly. But as a company inextricably tied to the paper industry, how can HP promote sustainable consumption? We caught up with Michelle Price, HP's worldwide environmental strategic marketing manager, to ask her a few questions about HP's latest green initiatives.